St Mary's College were denied a second Sigerson Cup title in three years as they suffered a 0-16 to 1-9 defeat by UCC in the final at Portlaoise. 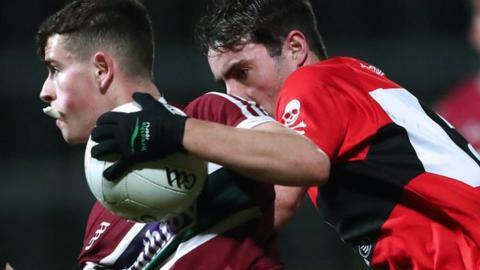 Armagh's Aaron Boyle was sent off in the 44th minute for the Belfast side, who trailed by three points at half time despite a Shane McGuigan goal. Kerry senior player Sean O'Shea was key for the Cork outfit, grabbing eight points, with five from placed balls. It was a 22nd Sigerson success for UCC, who beat NUI Galway in the semi-final. St Mary's were clinical in the opening half and failed to register a wide, with UCC defending well. The Cork team were 1-2 to 0-4 behind after 16 minutes following McGuigan's goal, but Billy Morgan's men worked hard with O'Shea hitting three of UCC's final four points of the half as they took a 0-9 to 1-3 interval lead. St Mary's worked hard after the break with Miceal Rooney, McGuigan, Ryan McCusker and Stephen McConville on target to level the tie with 12 minutes remaining. They were down to 14 men by then after losing Boyle to a red card when he tangled with Kevin Flahive after having already picked up a yellow. UCC dug deep with five of the final six points, with substitutes James Naughton, Garry Murphy, and Conal ÓhAinifín all on target to help secure their first Sigerson title since 2014. UCC: M White; M Flood, K Flahive, G O'Sullivan (0-2); D O'Brien, B Begley, C Kiely; P Lucey (0-1), J Kennedy; P Clifford (0-2), S O'Shea (0-8, 5f), C Horgan; C Geaney, K Spillane, E Courtney. Subs: D Shaw for Horgan (HT); J Naughton (0-1) for Courtney (52); E Finnerty for Spillane (52); G Murphy (0-1) for Geaney (52); C Ó hAinifin (0-1) for O'Brien (59). St Mary's: M Reid; L Rafferty, C Dillon, M Rooney (0-1); C Byrne, R McCusker (0-1), A Duffy; J Óg Burns, L Devlin; S McConville (0-3, 3f), R Coleman, A Boyle; N Toner, S McGuigan (1-4, 1f), C McKinney. Sub: D McKinless for Byrne (52).